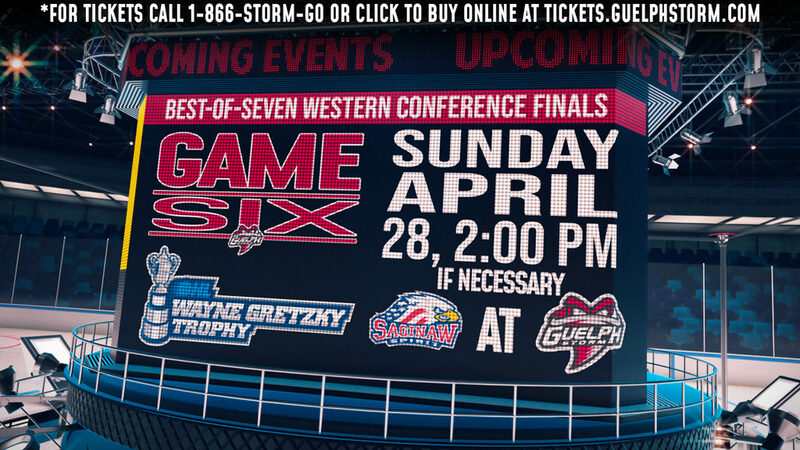 Injuries have dogged the Guelph Storm this season from day one. Several key players have missed time and as the team prepares for it’s final 18 games before the playoffs, nothing has changed. 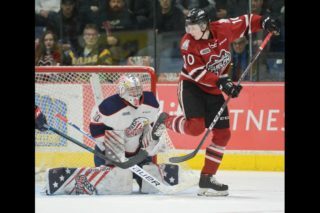 The Storm brought in several players at the trade deadline, among them MacKenzie Entwistle and Sean Durzi, and both missed games this pass weekend, along with Alexey Toropchenko, Pavel Gogolev and veteran defenceman Jack Hanley. Coaches always talk about the important of chemistry but in this case, with seven new players added in early January, having time to play with each other is crucial. Special teams need to pinpoint their strengths and establish trust, while five-on-five coaches need a deep understanding of each player’s tendencies to ensure smart breakouts and strong puck recovery in the offensive zone. “We need the time,” echoed the coach. “We have all these new guys and we haven’t even had a full team practice yet. Entwistle is expected back this weekend and Toropchenko is a possibility as well. Durzi is more game-to-game with an aggravated upper body injury he has been nursing all season. Hanley, who will be a real steadying influence on the blue line, is ahead of schedule and could be back in two weeks. Gogolev (broken ankle) is hoping to be back just before the post season. The good news is that Cam Hillis returned after a lengthy knee injury to help plug one of the holes. When and if all the players do return from injury Burnett will need to face another challenge and that is getting everyone enough ice time. He will have three players who have played top 6 minutes for much of the season, now on the fourth line. 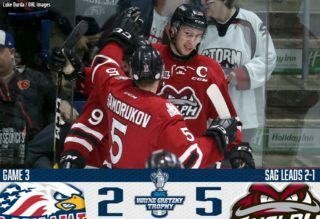 From the Land of Oz … If you were to hold a vote right now for the most improved player on the Storm I think Keegan Stevenson may just win it. 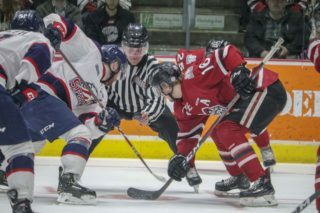 After amassing five goals and five assists all of last season, he has fired 17 goals in just 49 games so far this year and sports a +/- of 17… Back up goaltender Nico Daws won another game in Kingston on the weekend. He has played four games in the new year, sporting a .912 save percentage. “He has earned the right to play more,” said Burnett. 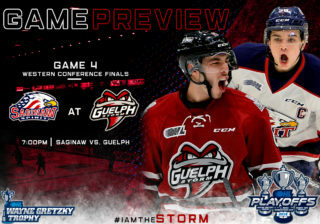 “He has the confidence of thestaff and his teammates.” Expect Daws to get another start this weekend as Guelph plays a home and home with Sarnia Friday and Saturday before hosting Kingston Sunday afternoon … Storm rookie Ty Collins had his best game of the season in Saturday’s win in Kingston. He potted three assists. 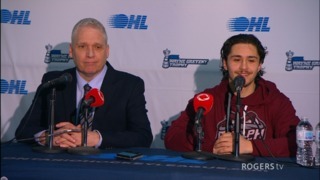 Liam Hawel had a hat trick in the contest and rookie Zack Terry scored his first OHL goal.